A skywatcher has photographed a troubled Russian Mars probe that remains stuck in Earth orbit three weeks after its launch. 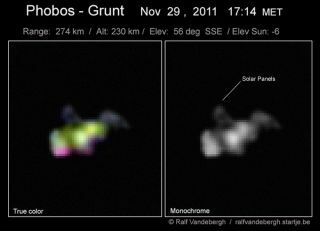 Astrophotographer and veteran satellite spotter Ralf Vandebergh tracked Russia's Phobos-Grunt spacecraft as it passed over the southern Netherlands yesterday (Nov. 29). Using a 10-inch (25-centimeter) telescope and a video camera, he snapped a series of images at a range of about 170 miles (274 kilometers). "It was bright in my tracking scope, I think it was clearly visible naked-eye as well with sun at -6 degrees," Vandebergh told SPACE.com in an email. "Striking was a kind of reddish-yellowish color I saw in the tracking scope." Despite the distance, the photos capture the broad shape and structure of the probe. The $163 million Phobos-Grunt probe launched Nov. 8 on a mission to grab samples of the Martian moon Phobos and return them to Earth in 2014 ("grunt" means "soil" in Russian). The spacecraft reached Earth orbit as planned, but got stranded there when its thrusters didn't fire to send it zipping toward the Red Planet. Russia has been trying to establish contact with Phobos-Grunt for the last three weeks in an attempt to salvage the probe's mission. Those efforts have been in vain. In a rare piece of good news, the European Space Agency announced last week that a ground station in Perth, Australia, had managed to pick up signals from the beleaguered spacecraft. Since then, however, repeated efforts to hail Phobos-Grunt — and get it to fire its thrusters — have failed, including another attempt yesterday. Even if Russian officials manage to regain control of the probe, it may be too little, too late. The window to send Phobos-Grunt on to Mars, which is based on a favorable alignment between the Red Planet and Earth, may already have closed, experts say. If the 14-ton probe remains incommunicado, it's doomed to a fiery death. Phobos-Grunt's orbit will decay, and it will come crashing back into Earth's atmosphere. Experts aren't sure when exactly that might happen, but some predictions point to mid-January. The prospect of an uncontrolled Phobos-Grunt re-entry makes some observers nervous, because the spacecraft is carrying about 8 tons of toxic hydrazine fuel. However, Russian officials have said that this fuel shouldn't make it to Earth's surface. Phobos-Grunt is also carrying a small satellite called Yinghuo 1, China's first attempt at a Mars orbiter. And the U.S.-based Planetary Society has an experiment onboard Phobos-Grunt that aims to test how journeys through deep space affect tiny organisms. Phobos-Grunt is the 19th spacecraft Russia has launched toward Mars since 1960. None has achieved full mission success.